Around 7 am PT today, Apigy, the company behind the Lockitron, announced on its Web page that it was accepting preorders for a new version of its keyless lock, which lets you unlock your door with your smartphone. Twelve hours later, the product-in-progress had received double its initial goal of $150,000 in preorders. So what’s so special about Lockitron? For one, it’s part of the growing trend of keyless entry to both cars and homes, as the New York Times wrote about here last year. For home owners who deal with a lot of foot traffic — dog walkers, nannies or tenants — it can be more convenient than carrying and sharing multiple sets of keys. The new Lockitron, which costs $149, will work with Bluetooth 4.0 in addition to Wi-Fi and NFC (near field communication) technology, presenting a broader range of options for smartphone consumers. So, if you’re using an iPhone 5, you can activate Bluetooth as you’re nearing your door and communicate with Lockitron that way — no Wi-Fi or data connection needed. If you have an NFC-equipped Android handset, you can swipe your phone against the lock and open it that way. Lockitron’s updated mobile app also sends a combination of text messages, push notifications and emails to let you know when the UPS delivery guy might have knocked on your door, whether the dog walker arrived on time and exactly when the kids got home from school. While some consumers might like the additional levels of security offered through systems like this, others might cringe at the idea of an obvious electronic box hanging on their front doors. 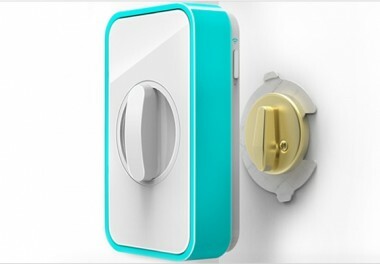 So Lockitron has designed a box that now fits over the lock on the inside of the door, but can still communicate with your smartphone or cellphone. Apigy says it sold about $100,000 worth of the last Lockitron, which started at the price of $295, just by word of mouth, and that the company had been hand-assembling the product themselves. Now Apigy has wised up, and is using the preorders as a way to fund production of the upcoming Lockitron. 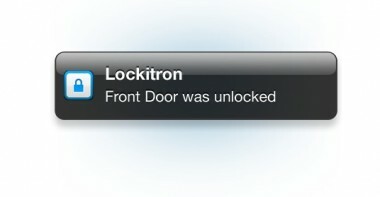 The new Lockitron is expected to ship in March 2013. In an interview with AllThingsD, founder Paul Gerhardt stressed that customers who preordered the product won’t be charged for it until it’s actually ready.